I did not tell my boys that ‘Crunchy-Munchy Chili’ sounded good on their school menu just because we were running late and I didn’t want to have to make their lunches, all the while throwing up in my mouth a little at just the thought of what might be “munchy” or “crunchy” in a bowl of chili. I did not hide empty tin cans in an empty microwave pop corn bag in the garbage, just to avoid having to peel the labels off and rinse them for the recycling container. And then proceed to get busted for it by my environment- lovin’ husband. Who then did not tell me to just leave them in the sink for him to wash and peel.. if I was too lazy to do it myself. I did not forget Sophie’s ‘snack day’ at school a few weeks ago, leaving the teachers at Sophie’s preschool wondering if I even had a brain. And my girlfriend did not overhear, while picking her daughter up from the same preschool, that it was no wonder I forgot snack day, as it looked as if I rarely cleared the papers out of Sophie’s backpack. That would be embarrassing if it had happened. I then did not continue to make myself out as “Worst Mom of the Year” by forgetting to put Sophie’s Dora doll in her backpack for her show-and-tell day last week. Even though I had written it on my calendar. If I had done that I would have to hang my head in shame, hopeless to ever regain my ‘regular’ (as in non-pre-Alzheimer’s) mom status at said preschool. Whew! Good thing I didn’t have to get those things off my chest! Hey, don’t be to hard on yourself we all have forgotten snack day! lol…… I to write in on the calendar but in the haste of the morning forget to look sometimes. I always try to send a snack at the first of the month with a reminder to the teacher if anyone forgets snack day to use this. I have caught myself a couple times using that snack when its the girls turn. lol……. LOVE IT!! I truly believe that those preschools set us up for Mommy failure. Seriously, Bring a snack on Tuesday, Wear Yellow every other Wednesday, Bring an apple to school in 3 days, Don’t forget your family scrapbook collage….Come on! I know that it gets them involved but it just makes me look like a slacker mom half the time! Well I am off to the store to get all the necessary items to make tootsie pop ghost for preschool tomorrow…Wouldn’t want to forget that one! LOL! Funny Girl! I’m loving the recycle thing! LOL! I could relate to ALL of these… I never peel my labels off the cans. Doesn’t the recycle place do that??? Give yourself a break on the crunchy munchy. It is probably fritos (aka frito pie) and you may have to make it that way from now on, cause it is addictive and the boys will probably love it! Oh my gosh, you are too funny!!! I am so glad to hear that you forget things too! Having pre-schoolers is so humbling!!! Stef, that was funny! But i have to agree with your husband on the recycling thing…you naughty girl! The amount of papers that come home from pre-school is concerning…I almost asked the front desk if it is necessary for the pre-school to fell an entire states worth of fir trees? As for forgetful…I keep showing up to gymnastics at 11.45 instead of 11.10….I get her swimming lesson and her gymnastic lessons mixed up. Let me tell you, Piper is not amused to miss out on half her class! Don’t feel too bad. I forgot THREE things last week that were written on my calendar. One of ’em I felt so guilty about, I just about made myself sick over it. My youngest son missed a “MAJOR” Cub Scout event (well it was major to him). You know the worst part … he has not mentioned it and NEITHER HAVE I. Is that not terrible? But I just knew he and his little buddies would discuss it at school the next day but they didn’t, so I decided just to forget about it. Or at least try to. I don’t know how you juggle eight b/c three is about to get the best of me. My SIL said Susannah was like a “newborn times three” and I think she might be right! The little darling is keeping me on my TOES! Love your post and your blog!!! LOL are we soul sisters????? Awww Stef. i am with ya sister.. Harry’s teacher is getting REALLY angry with me because I forget to sign a sheet each week that informs me he earned a sticker everyday for good behavior. Come on! I could see if it was bad behavior or something. It is hard to do it all well. 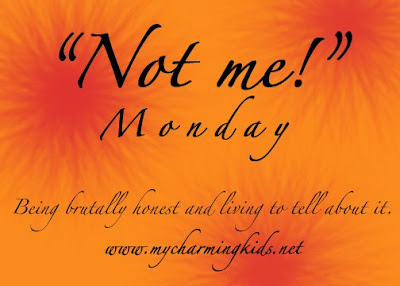 If I had tme this week I could do a GREAt not me Monday…I might save them for next week! Sounds like a day in my life! You are not alone. But what really matters at the end of the day is that our kids are safe, warm, healthy, loved like crazy, knowing that they will be loved forever, even if we feel like we are losing our minds. Too funny! I thought the same thing when I read about your “crunchy” chili…yuckers! Did you ask the kids what’s crunchy? I’d love to know. I was failure mom last week. Teacher says “bring red, yellow, orange leaves, pine needle, nut or seed.” So ever efficient mom (me) has that all packed up. When project comes home, brown pine needle that I packed was a green one. Teacher wanted a green one. Teacher didn’t say green! No nut on project, but a “helicopter” seed. Nut was too bulky for project. Then don’t ask for a nut! It’s nice to know I have a fellow failure mom out there. I have written about 2 of those very things on my blog. One about the amount of papers that come home in my Kindergartener’s backpack and how its overtaking our house. Her backpack usually only gets cleaned out when SHE takes the paperwork out. The other was forgetting to send Jenna to school in pajamas on PJ day. That post was NOT funny, I couldn’t believe I did such a thing and in fact titled the post The Unpardonable Sin. Bottom line, we’re human, we screw up our kids love us anyway. Thank Goodness! I’m lovin’ the “sure that sounds yummy” (GROSS! )….I sometimes bend our own rules and such around here to get out of making lunch!LOL! Wow, if I had 8 kiddos I would be lucky to remember my name, let alone a doll! Thanks for sharing!